On Tuesday evening, I had the chance to see Banksy’s film Exit Through The Gift Shop (in cinemas March 5th) at the pop-up cinema he has put together in the tunnels next to Leake Street (where he held Cans Festival). It was an experience that I’ll never forget. Outside the entrance, Banksy has painted a red carpet onto the street. Inside, it’s like a mini-exhibition. A mix of new and old works, the highlight for me was the “Paranoid Pictures” logo which has been stenciled onto one of the walls. Or maybe it was the animatronics from Banksy’s Pet Store show. It’s tough to say. But the art got everybody in the mood to watch what we’d been invited there for: something that involved Banksy, a video camera and Mr. Brainwash. Beyond that, most of us were in the dark as to what exactly was going to be shown. Exit Through The Gift Shop is not going to be the Subway Art of street art (Beautiful Losers and Bomb It have already attempted that anyways…), and it’s not trying to be. It’s not “The Banksy Movie” either. And I think that’s going to disappoint a few people. 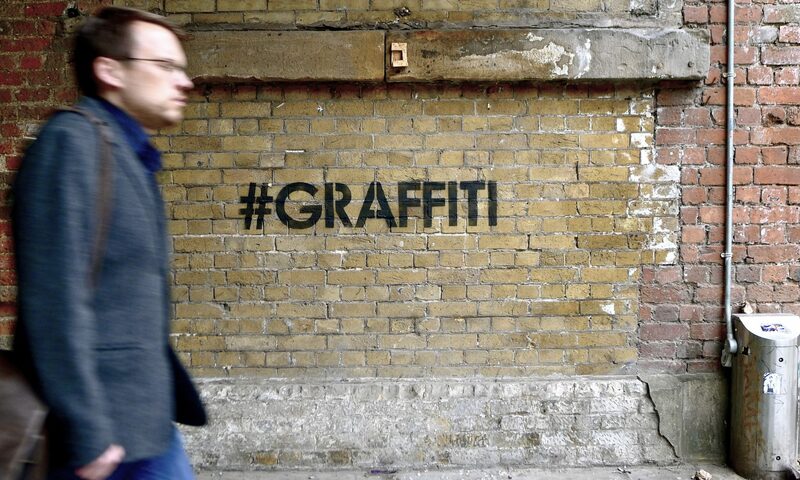 But if you’re a regular reader of Vandalog, you probably like street art, not just Banksy. Exit Through The Gift Shop is a film that you’ll enjoy. The film is a documentary that comes across as a mockumentary. I’ve heard people plenty of people compare it to Spinal Tap or Borat. But everything in Exit Through The Gift Shop is more or less true. Of course, I’m sure certain half-truths are told, but it’s about as factual as you can get when it comes to talking about anonymous artists. The important thing here is that all the characters are real people, and the events on film actually happened and were unscripted, so that seems real enough to me. There’s a line every five minutes that might be quoted by street art fans for years to come: Some of them are funny, some are poignant and some are depressing. The whole film is mixture of comedy, drama and tragedy, but every angle will be compelling to street art fans. The big problem though, is that I just can’t imagine telling my friends who don’t like art or film to check out the movie. It’s not like Spellbound or (in my opinion, not that of my friends who stopped talking to me after a certain movie night…) Helvetica; if you don’t like street art (or at least art or documentary films in general), you may just be left confused and bewildered by the whole thing. I suppose that’s the point, but last time I checked, Banksy’s work isn’t supposed to confuse people, it’s meant to be clear, direct, funny and hopefully provocative. And where the film could have most interested audiences outside the street art world, examining how money and marketing plays a role in the art market, Exit Through The Gift Shop hints at these issues, but falls short of actually confronting the subject head on, leaving the audience to consider the consequences. While people certainly are smart enough to see what’s going on and figure these things out for themselves, I think Banksy could have been a bit more direct about the whole thing. Perhaps the film’s greatest flaw is that it ends on more of a decidedly bleak pop than a spectacular bang or even just a hopeful note of any sort. Minor issues aside, most street art fans will absolutely love this film. It is hilarious, has behind-the-scenes footage of Banksy and other great street artists at work and tells a story that needs to be told. I can’t say much more without spoiling the plot. 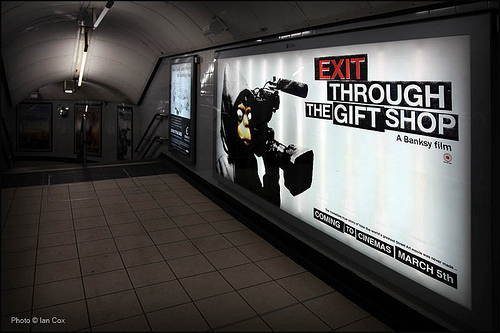 Okay, and now for a spoiler after the jump…Exit Through The Gift Shop is a film about Mr. Brainwash. How MBW got involved in the street art world, shot and directed what those who have seen it consider to be one of the worst films even made, started painting and eventually began selling his paintings for hundreds of thousands of dollars. It can pretty much be summed up by saying that Mr. Brainwash is the street art equivalent of Milli Vanilli, or if we’re being kind, The Monkees. The big question now is… what will happen to MBW’s artwork? Are prices going to soar even higher, or will the market collapse as collectors realize that they’ve been had?